Getting a job onboard a cruise ship can seem glamorous - after all, what negative aspects could there be to traveling to exotic locations and living 24/7 in a fun, vacation-like atmosphere? The truth is, like any profession, there are pros and cons to working onboard a cruise ship. And you should consider them all before choosing to pursue this kind of work. No job is perfect, so make sure you are fully informed about what life on a cruise ship is like before you accept a job on one. The following lists of pros and cons certainly aren't exclusive. So make sure you do your homework and find out as much as you can abut working on a cruise ship before you make the decision to work on one. Here are some of the considerations to keep in mind. To get first-hand information from current cruise line employees and read in-depth profiles of the leading cruise lines, activate your CruiseJobFinder membership. You will be able to travel to exciting locations and see some of the world's most beautiful scenery. You will meet people, both co-workers and travelers, from around the world. You can earn good pay, especially if your job involves working with passengers and you receive tips. You will gain very good experience in the hospitality industry or as part of the nautical crew that can translate into even better jobs on land or elsewhere at sea. The cruise line industry is expanding at a phenomenal pace; there are more opportunities for cruise line crew members than ever before. Although you'll work a lot of hours, you will have time to explore ports of call and relax. Even though you aren't in the navy, cruise ships are run like navy ships. The captain is the leader and has ultimate authority, no matter what your job is. You will need to respond to the captain and other crew members appropriately. Your living quarters will be small, and it is very likely you will need to share your room with a roommate. The food is not always delicious for the employees onboard the ship. You will be eating in your own mess hall, and menus will not be the same as the passengers'. Some cruise lines do give employees the opportunity to eat at one of the onboard restaurants once a week. You will work long hours, and the work can be stressful and demanding. This is especially true if you work as a server in a restaurant or in housekeeping. Keeping up with your passengers' requests can keep you on your feet and busy throughout your work hours. In some positions you are expected to socialize with the passengers when you aren't working. Many people enjoy this, but after an especially challenging workday, this can become tiresome. 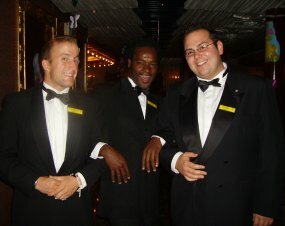 You will be expected to be in uniform with your name tag on and behave as a representative of the cruise line whenever you are on duty or visible to passengers on the ship.